As a consumer of audio and video in many forms—CDs, DVDs, and online purchases—I find it interesting to watch as the various media businesses adjust to life in a digital world. On the music side of the world, it seems that (slowly but surely) they’re starting to “get it.” Consumers don’t like to be hassled by digital rights management (DRM), they want to pay a fair price, and they want to use their music on devices they own without worrying about format, rights, or permissions issues. For the longest time, the music industry insisted on copy protection for online music sales, even though (higher quality) CD versions of that same music were (generally) shipped without any form of copy protection. So at first, everything you bought from the (then) iTunes Music Store was protected by FairPlay, Apple’s generous (but still restrictive) DRM solution. In June of 2007, though, the first chinks in the DRM armor appeared, with Apple and EMI announcing iTunes Plus, DRM-free music at higher bit rates for $1.29 per song, versus the 99 cents per song for the FairPlay-protected versions. Then, in September 2007, Amazon launched its own MP3 download service. Unlike the iTunes Store at the time, music in the Amazon MP3 store was (and remains) completely free of DRM. As a consumer, I was intrigued, and tried it out. While the Amazon MP3 store can’t rival the rich experience you get in the iTunes Store, it’s not a bad solution, and its download tool automatically adds my purchases to iTunes. Finally, to put the proverbial nail in the DRM coffin, Phil Schiller announced at this year’s Macworld Expo that the iTunes Store was going DRM free—at the expense of Apple’s one-price-fits-all strategy. Over the next few months, the entire 10-million-strong iTunes Store music catalog will migrate to DRM-free versions (at higher bit rates)—Apple claims that more than 80 percent of iTunes music is available now in iTunes Plus format. So it seems, finally, the music industry gets it. Given the chance, consumers will pay a reasonable price for unprotected, high quality music that they can use as they wish. Unfortunately, the video industry hasn’t yet apparently seen even a flicker of such enlightenment in the distance. You can see evidence of their confusion all over the iTunes Store, starting with iTunes Plus. iTunes Plus applies only to music in the iTunes Store, not to video (or audiobooks, for that matter). So while my music will be “free,” I’ll still be messing with authorizations for the video content I purchase from the iTunes Store. That’s unfortunate, and strange, given that the large size of movie files means they’re typically harder for consumers to distribute than relatively small music files. Why is an HD movie different than an HD TV show? Beyond iTunes Plus, you can see more confusion in the handling of high definition (HD) content on the iTunes Store. 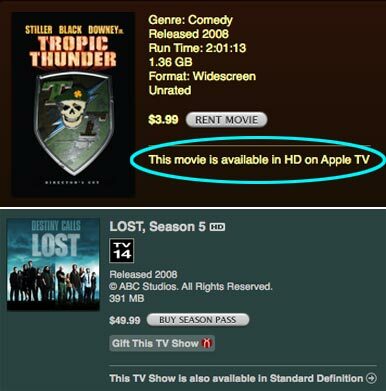 You can, for instance, purchase a TV series in HD and watch it on your Mac or Apple TV…but you can’t purchase an HD movie at all, and you can only rent them on an Apple TV, not a Mac. Why? What’s different about an HD TV series and an HD movie? From my chair at least, nothing. I know, behind the scenes, they’re controlled by two very different entities, but as a consumer, such things shouldn’t matter. When I want to purchase HD content, I want to be able to use it on whatever device I wish, and transfer it easily between all such devices I own. The current model is just completely confusing, and makes no sense. It really makes no sense when you consider that the video industry is taking these protective steps against those who are probably least likely to steal their content—consumers who have decided to purchase through the iTunes Store. We’ve made a conscious decision to buy our audio and video through the iTunes Store, and yet the video industry treats us as though we’re all pirates foaming at the mouth, ready to upload our freshly-purchased content to every pirate server in the known universe. If I want to steal a movie, there are many ways to do so quickly and easily, as seen in the image at right. 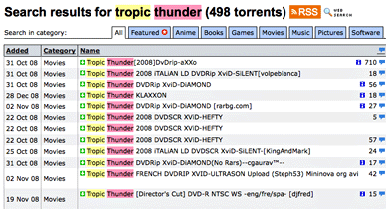 Using Tropic Thunder, the movie in my sample image above, it took all of one Google search to find literally dozens of different versions of the film, with varying levels of quality and features. Quite ironically, a stolen movie is actually easier for the consumer to use than a legitimately-purchased copy of the same movie. A stolen movie won’t be DRM-protected, may be encoded at a higher bit rate (better quality) than a purchased version, and can be easily played on any device capable of playing back video. Why is it that pirates are rewarded for their actions, while legitimate consumers are punished and treated as if they are pirates? By making it difficult for honest consumers to purchase and use their products, the video industry may be encouraging the very behavior they seek to stop. My final annoyance with the video industry and the iTunes Store has to do with the pricing of TV series—another behavior that may drive otherwise honest consumers to take dishonest actions. The new season of 24 started recently, and for better or worse, it’s a series I enjoy watching. Given how much time I spend in front of the machine, however, I thought that maybe I’d purchase the 24 Season 7 HD season pass from the iTunes Store. As it turns out, I can actually watch 24 for free (and legally) on Fox’s Web site—and in full-screen mode, the video looks quite nice even on my 23-inch LCD. Sure, it’s not available on all my devices, but if what I really want to do is watch something on my Mac, free sure beats $70. If I really want 24 on all my devices, and I find the $70 to be a huge burden, another quick trip to Google finds that all four episodes of the new 24 season are readily available online. Legal? Not even close. A tempting alternative for those who aren’t able to afford $70, or perhaps live outside the geographically-restricted area where they could buy 24 even if they wanted to? You bet. So by pricing the season at a somewhat ridiculous price point, Fox has not only lost a sale, but has probably encouraged people who would otherwise give it money to go find alternative solutions. For me, I would’ve gladly paid about $30 to $35 for the season pass—the ability to watch on any device would be nice, and I’d love to feel like I’m supporting the series. Instead, I’ve chosen to do what I’ve done the prior years—record 24 on my Tivo, and then watch it (skipping commercials) on the big screen. Not as convenient as having it available everywhere, but $70 is simply well past my cutoff point for a convenience cost. Some shows get it, it seems. You can buy 16 30-minute episodes of The Daily Show for $10, or about $1.78 per hour of entertainment. Contrast that with 24, which will cost you $3.80 per hour (I’m using the actual show lengths here, i.e. 21 minutes or so for The Daily Show and 44 minutes for 24). But The Daily Show is an exception; current seasons of most TV series seem priced to dissuade purchase, rather than to encourage purchase. I firmly believe that if the prices were to be halved, volume would increase dramatically—and it’s not like there’s much direct cost in producing the downloadable version of an already-filmed TV show, so almost all the money the studios would earn through increased volume would be profit (less what they must pay out in commissions, of course). So why are they asking such outrageous sums for current (and non-current) TV series? Hopefully the video industry will see what the music industry has done and take steps to adjust its rules on HD content, its stance on DRM, and its pricing policies. As things stand now, however, video producers are treating their customers like thieves, and encouraging them to find alternative solutions that are less costly, unencumbered by DRM, and more agreeably priced. Some alternatives are legal, others are not…but no amount of protection on iTunes Store videos is going to change that fact. Pirates will pirate, and the current iTunes Store video rules hurt only those who seek to legitimately purchase their content.